GRAND CANYON VILLAGE, Ariz. — If you ask people which part of the Grand Canyon National Park they like the most, you will most likely get answers such as Bright Angel Trail, Hopi House or Hermits Rest. 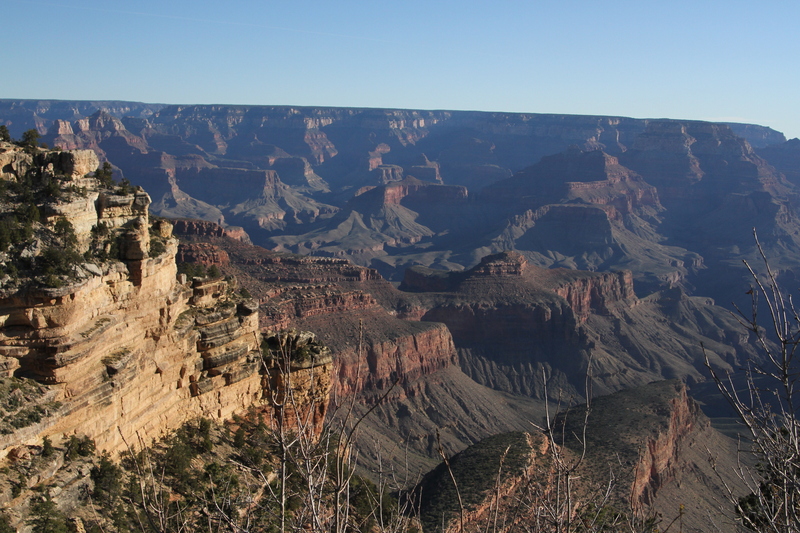 But what fascinates me the most is the 25-mile Desert View Drive on the South Rim that spreads all the way to the Desert View Watchtower and East Entrance. I know when people think about the Desert View Drive, the first thing comes into minds is probably the Desert View Watchtower. I was not the exception before I actually got on the drive. Heading east from the village, I was not expecting anything special besides the beautiful canyon views after being in the canyon for one and a half days. Canyon views can be seen almost everywhere inside the park and most of them looked similar to me. They were gorgeous, I admit, but I started to get used to them, especially after visiting Hermits Rest on the far west end of the South Rim. Therefore, when we set out for the Desert View Drive, I thought it was just a normal day in the canyon. The first stop was Pipe Creek Vista. The morning wind was a bit chilly, but with the fresh air and the general canyon view in front, though I was not as excited as the first time seeing this, I was still amazed. And my day got better from there. Grandview Point was our next stop. We got out of the car and looked around, the stop seemed usual like other places inside the park — a platform with great canyon view. However, a small trail attracted me as I looked down from the platform. It was not clear. Most of the trail was hidden behind the rocks and the bushes. But, from a distance, the trail seemed to lead to a huge rock formation down in the middle of this section of the canyon. As someone with an adventurous heart, I decided to explore the unknown. The trail was kind of steep and small, loose stones were all over the trail and they made it slippery. Even when I followed the trail, it was hard to tell where did it lead. But that rock I saw from top and the view there were so attractive that I did not want to give up. Carefully running down the trail and making a couple of turns, there it was, the rock formation that I sought. I could already tell it was fascinating before climbing onto the rock. 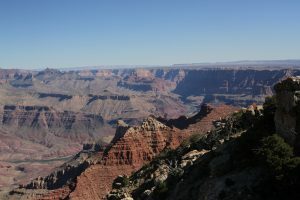 The rock spread horizontally out like a platform towards the middle of the canyon and provided a brand new angle for the canyon. Finally stepping on the rock, I have never felt so close to the canyon before. I was thrilled with the excitement of being on the edge of that rock. My heart beat faster and my hands started to shake. But it felt so good at the moment, kind of like the thrill of being on a roller coaster. The sight was different from what I saw when I was at the top looking down. Though there was still large distance to the bottom of the canyon, it was close enough compared to all other places I have been and it felt like I was in the middle of the canyon anyway. I did not even know how to express my emotion at the moment. 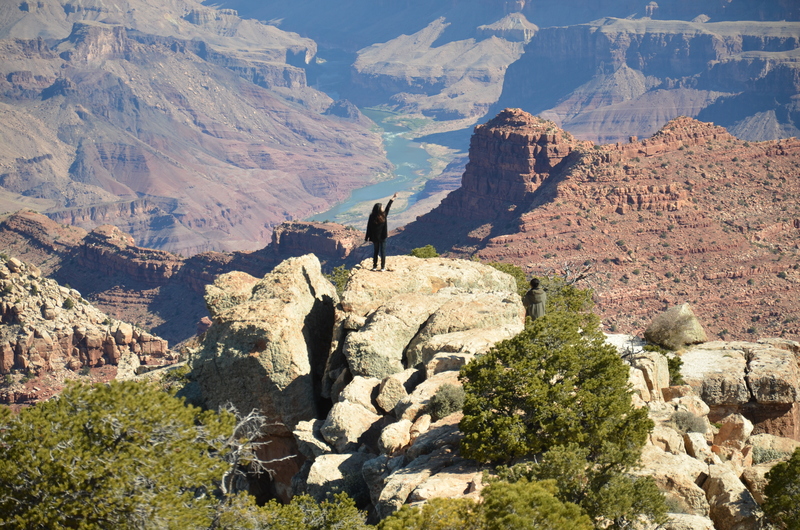 I was so overwhelmed with the beauty and the splendor of the canyon and lost in awe. With me proving the possibility of getting closer to the canyon, soon Nolte and another friend, Lingyue Zheng, joined me. “This is so cool!” Nolte commented. I agreed. 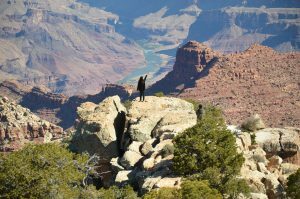 It was one of my best experiences ever, especially when I did not have enough time and energy to get down to the bottom of the canyon hiking down Bright Angel Trail a few miles to the west. This was a perfect place for me. A Korean family was attracted to what we were doing and found their way down to the rock as well. The mother stood far away, too afraid to get closer while the father took two of their young sons, all excited like me, on the rock. Happy times always pass too fast, though I was not willing to leave and hoped the time could stop at that moment. I finally got into the car and could not help wondering if there were any more places like this along the way. From that point on, I started my exploration and found out that most of the stopping points along the way had trails offered a way down into the canyon. I could not stop myself being overexcited to be on the edge and kept pushing the limit. If not because it was too dangerous, I would like to jump on those rock formations as well. Every time when I stepped on them and looked around, I could feel how small I was and how wonderful nature could be. I was so connected to the canyon at those moments. They made the Grand Canyon my favorite park. Not that many people had the time to explore these wonderful hidden spots, and not that people had the courage to go that far toward the edge. But if you have an adventurous spirit like me, those places will be thrilled spots that you could remember for a lifetime. I could not stop talking about them even after I came back from the park. I wish everyone who visits the park would take time to enjoy what I experienced on those formations because my words are so unable to properly describe the wonders of the nature. 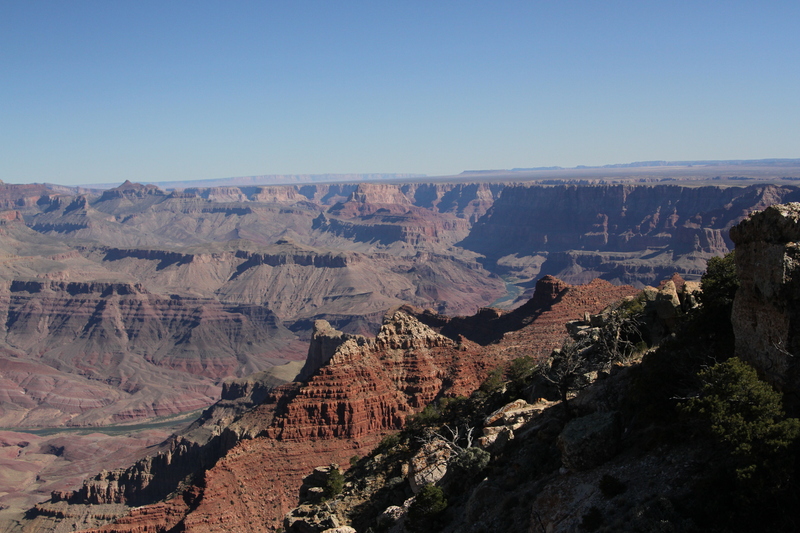 If you want to take a closer look at the canyon, do not miss these places. Take a bit of courage with you. Be on the edge. Distance: 25 miles east of Grand Canyon Village to Desert View.